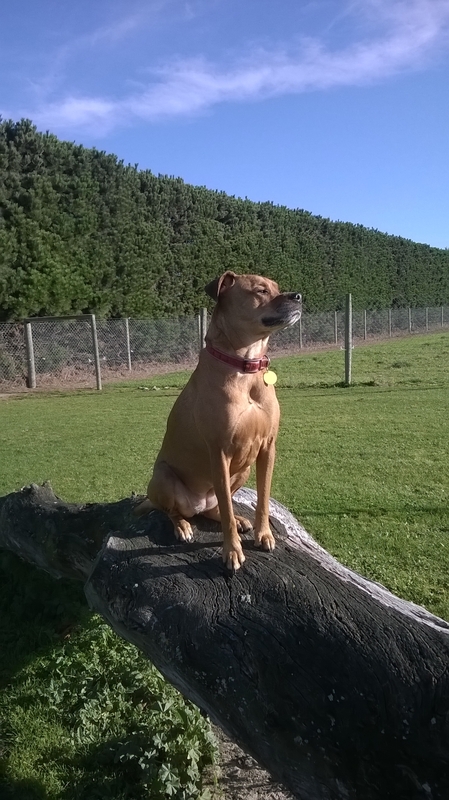 When dealing with dogs with special needs, one of the key principles is ‘management.’ Management can take a range of forms, but it always involves adapting and changing lifestyle to suit the dog. In Kess’ case, Ian and Jan accepted that her on-lead behaviour was going to be almost impossible to eradicate. They adapted their walking routines to suit. Kess would have a short daytime walk in a quiet area and then a longer evening walk either in a park or very often through the central city of Christchurch. This worked well as there were plenty of people about her but very few other animals. Ian and Jan felt that they were making some progress with the reactivity and could happily take her into quite busy areas. Unfortunately, the Canterbury earthquakes which started in September 2010 with another large jolt in February 2011 halted that progress. Since the earthquakes, Kess’ anxiety levels have remained at very high levels. She has become much more anxious of strangers which has meant adapting the walking routine. For the first 18 months, the family continued to walk through the central city at night, following the Avon River around the outside of the Red Zone cordons (for those that don’t know, the central city area was heavily damaged and evacuated). Jan and Ian quickly learned that hi-vis wear and army cordons were a cause of stress for Kess so avoided them. Despite these concerns, Jan and Ian found these walks peaceful and reflective. 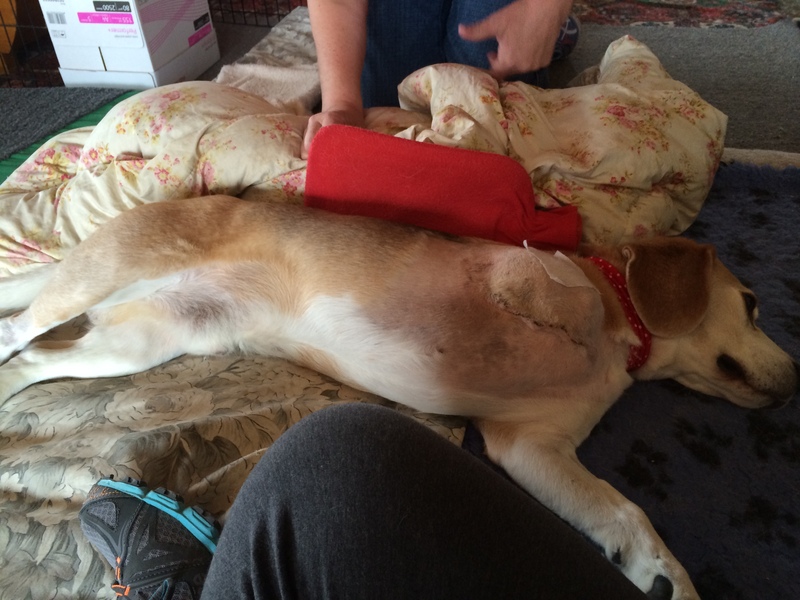 Post-quakes, Kess’ health issues have also been more of a problem for her. 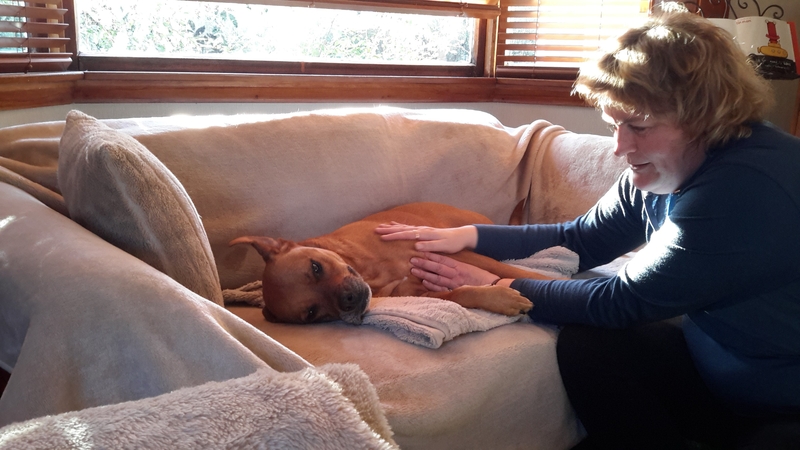 In my opinion, Kess was already a very sensitive dog and the earthquakes simply added to her load – further weakening her stressed immune system. She contracted toxoplasmosis, a parasitic disease, probably from drinking from a puddle or other contaminated water source in 2012 (cats are regular carriers of toxoplasmosis). She suffered seizures and general ill health for several months. “We almost lost her.” Treatment was a mixture of veterinary care and natural animal health care and remedies. Then, in 2013 when the couple were staying in temporary accommodation while their earthquake-damaged house was repaired, Kess had a major episode with pain in her spine which left her immobilised and howling in pain. An emergency trip to the vet and medication followed. In a bid to reduce the medication she had several acupuncture sessions but became resistant to this. “She has an amazing ability to turn into a solid, resistant brick when she doesn’t want to do something,” says Jan. This led the couple to look to yet more alternatives. This is when Jan contacted me and we entered a whole new realm of support for Kess’ health. I used massage, manual acupressure and laser therapies with Kess and she started swimming at the Dog Swim Spa. Kess was unable to benefit from swimming because she developed a stress reaction to the shower which was a necessity after each swim in a chlorinated pool. So , we agreed that swimming be dropped from Kess’ therapy. But an osteopath was added in 2014 to help release Kess’ back tension. Osteopathy and massage therapy work very well in conjunction with one another and so the current plan is to keep up with both. 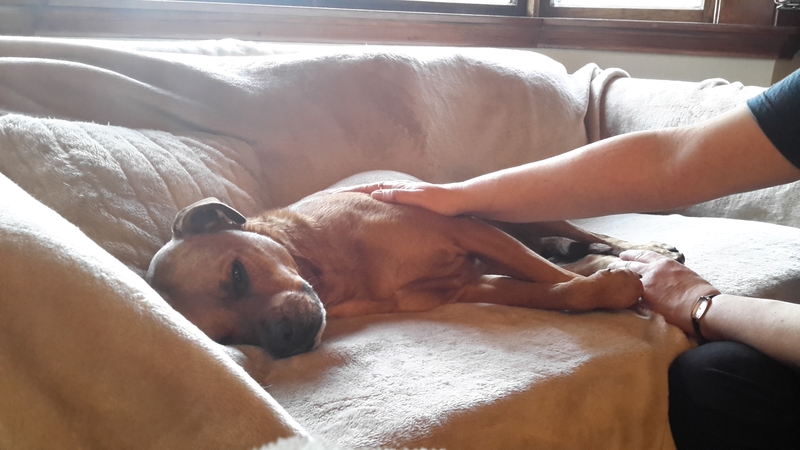 More recently, Ian and Jan have noticed that Kess’ anxiety levels have been on the rise and she has been out of sorts which included frequently shaking her head and looking distressed. She also developed an aversion to the laser and its ‘beeping’ noise and so we’ve dropped that from her regime. 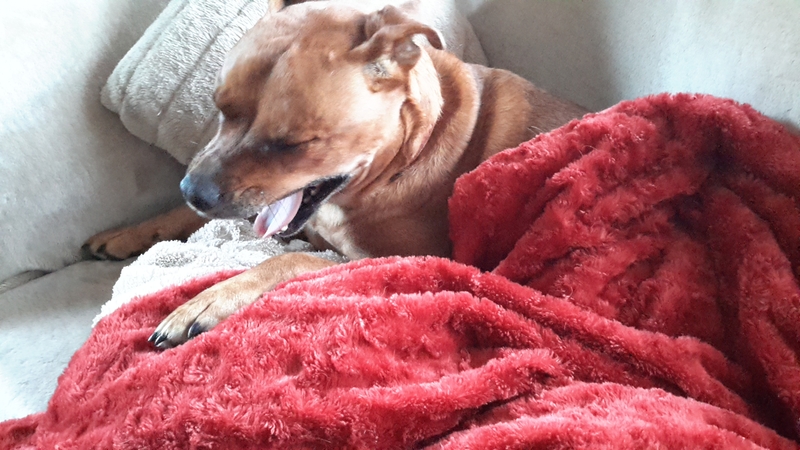 After ruling out any ear or tooth problems a specialist vet has recommended Kess undergo an MRI examination to rule out any possible deeper issues with her brain, inner ears or throat area. Because Kess has been anxious, Jan has also been anxious about their daytime walks. We discussed cutting back on walks in favor of playing in the family’s yard. And what we talked about was the fact that Kess was never truly ‘free’ because her anxiety condition prevented Jan and Ian from taking her to a dog park or similar off-leash area. We needed to re-group about Kess’ mental health. Ian and Jan love Kess and are devoted to her, acknowledging that she has been hard work and a significant investment of their time. I think what Kess’ story proves is that ‘difficult’ dogs can still be loveable pets (one trainer suggested she be euthanized when their attempts at training Kess ‘by the book’ failed). These dogs just need more time and effort invested in them; we need more people willing to stick with the tough times – a loving companion and lifelong relationship awaits.